Seats in sections C115, C136, C137 and C138 are among some of the best options for impressing a guest at Levi's Stadium. Seats in sections 132, 133, 134 and C135 come highly recommended for seeing the action at Levi's Stadium. Seats in sections 302, 303, 304 and 325 were hand picked as great places to sit for children and families at Levi's Stadium. 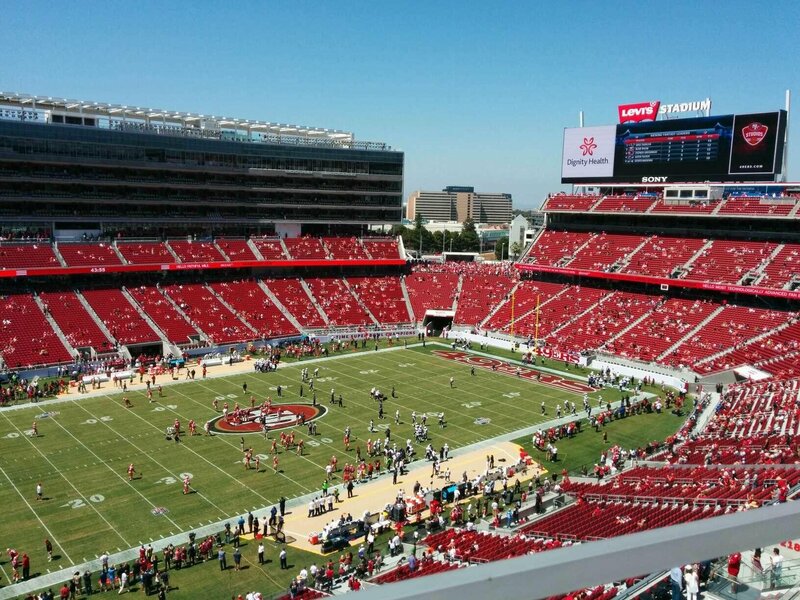 Giving you the best straight away views of the field at Levi's Stadium from every level of seating. Sections C113, C114, C115 and C116 are where you will find some of the most ideal viewing angles to the very center of midfield, allowing you to sit comfortably without needing a big head turn to follow the action. The 49ers sideline is located just in front of Sections C136, C137, C138 and C139 at Levi's Stadium. 49ers fans tend to crowd the sections directly behind the sideline, which creates a great atmosphere for home-town fans. The closer to the 50 yardline you are, the closer you'll be to a majority of the players. "Shaded, extra foot room, prime!" - ★★★★★ - Close to food, restrooms, very nice.